Mr. Sanders was admitted to The Riverside on October 23, 2017. As stated in a previous case study, he was admitted for right transmetatarsal amputation from Mount Sinai West Medical Center. Poor circulation in his right toe lead to further amputation of his right foot. Several months later, reduced granulation tissue on the foot lead to a complete below the knee amputation. As of March 1st, 2018, Mr. Sanders and his team of therapists got to work. His therapist, Jennifer Cohen instructed Mr. Sanders on wearing a shrinker sock prior to obtaining his prosthesis. The purpose of the shrinker sock is to control swelling on the amputated leg, promote healing, and assist with shaping the amputated leg. This sock would create a consistent shape on his lower extremity, allowing the prosthesis to fit properly. His therapist educated him to conduct skin checks along the amputation site using a long-handled mirror. The mirror would be used to check areas along the site, which cannot be visually seen without assistance. As soon as the doctor evaluated the surgical site, he deemed it healed. Mr. Sanders progressed into learning the steps of how to put on the prosthesis. The order became automatic after practicing several times. He was educated on waiting to listen for the clicks in order to assure that the prosthesis was secured properly. Following a strict order of how to put on the prosthesis is necessary to properly wear the prosthetic and to ambulate safely. Once the prosthesis was put on correctly, the next challenge was walking. 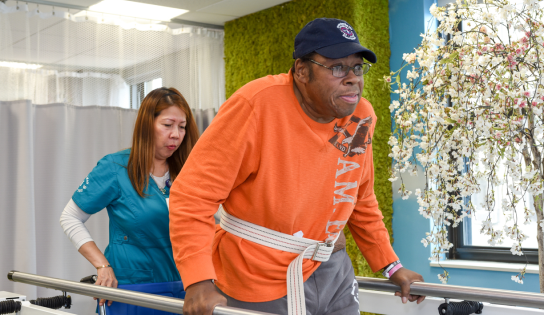 Mr. Sanders learned to walk with the least restrictive assistive devices. First, the walker, followed by the quad cane, then finally the single point cane. With a tremendous amount of support from Dennis and Todd, they coached him on walking without a cane. It took time to gain his first full stride, but with Dennis and Todd at his side, and strong encouragement from his therapist, Mr. Sanders took his first steps. Staff members and residents watched in awe as Mr. Sanders took his first step. There was a round of applause from every corner of the room. Dennis and Todd walked to Mr. Sanders embracing his magnificent accomplishment. Mr. Sanders was beaming with pride at what had just happened and looked towards his team of therapists with a big smile. He could not stop thanking his therapists for sticking with him through his recovery. As he continued to practice every day, Mr. Sanders was walking everywhere he could. Part of the Amputee Walking Schools program involved coaching other amputees in the building through emotional support. Meetings took place in the 15th-floor lobby after the weekly Urban Zen class. Mr. Sanders would joke that the first order of business is to take part in the Urban Zen class before members of the Amputee Walking School met. He met regularly with two other members of the class. Each member spoke as if they were long lost friends. They discussed how they became amputees and what they are looking forward to after completing their stay at The Riverside. They each provided one another with emotional support, even after the meetings were held. Mr. Sanders’s goal was to return to work at the theater. He was gearing up for the warmer temperatures which would involve walking around the city, taking different paths, exploring different streets, and watching boats sail across the Hudson River. On Mr. Sanders’ last day at The Riverside, he was invited to speak to the staff about his stay. Mr. Sanders rolled his wheelchair out of his room and stopped short of the staff. The staff eagerly waiting to hear from him, he locked the brakes of his wheelchair, and finally stood up without any assistance. It was a truly momentous occasion for him as well as the staff. Upon admission to The Riverside, he could not even lift his body out of bed. Now he is walking towards them with a giant smile on his face. The staff and residents on his floor started clapping for Mr. Sanders as if he was a big Broadway actor finishing a grandiose theatrical performance. Mr. Sanders expressed his thanks to each staff member by name and there was a deep emotional connection that can be seen and felt. Staff members said their goodbyes to him as he walked out of the building into a Yellow Taxi that was waiting for him. We at The Riverside applaud Mr. Sanders for his hard work and dedication. May he continue to take one step at a time, always looking forward to a bigger and brighter future.